In this Article, Professors O’Hara O’Connor and Franck adapt and extend Larry Ribstein’s positive framework for analyzing the role of jurisdictional competition in the law market. 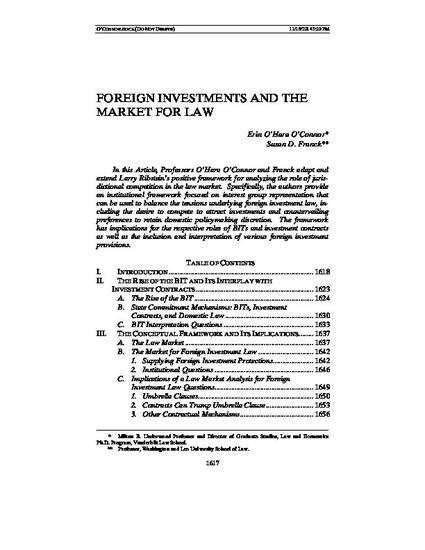 Specifically, the authors provide an institutional framework focused on interest group representation that can be used to balance the tensions underlying foreign investment law, including the desire to compete to attract investments and countervailing preferences to retain domestic policymaking discretion. The framework has implications for the respective roles of BITs and investment contracts as well as the inclusion and interpretation of various foreign investment provisions. Erin O'Hara O'Connor and Susan D. Franck, Foreign Investments and the Market for International Law, 2014 U. Ill. L. Rev. 1617 (2014).